Colonel Eustace Graham Keogh, Military Training, 1945. 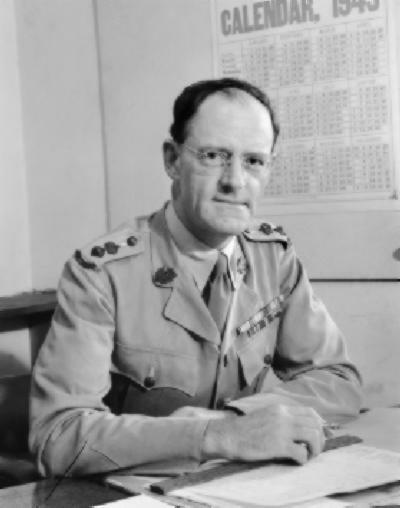 Colonel Eustace Graham Keogh was commissioned by the Directorate of Military Training to produce a survey of the Sinai and Palestine campaign for training purposes of the Army in 1954. The result was his book called, Suez to Aleppo, published in Melbourne in 1955. This particular book was little used in the study of the Sinai and Palestine Campaign because of the embargo placed upon it by the Army which meant that its pages were only available to those who were members of the Army. Consequently the value of this small work has never been brought to the attention of the public and consequently is often ignored as a source by many scholars of this period. It is a fine book written specifically from a military point of view and thus looks at issues as the men would have done so at the time when these events were being recorded. Beersheba lies on the Wadi Saba at the foot of the Judaean range. There are steep, rocky hills to the north, east and south of the town, which lies in a wide hollow. On the west the ground is comparatively flat and open. On the south-west and south the defences consisted of a series of redoubts along a line of heights three to four miles from the town. These works were strongly built, with good observation, overhead cover and some wire The defect of the system was a lack of depth; in most places it consisted of a single line only. With the exception of a formidable redoubt at Tel el Saba, the defences east and north of the town were less strongly constructed and were without wire since the Turks did not apprehend attack from this direction. 20 Corps was to assault the works south-west of the town between the Khalassa-Beersheba road and the Wadi Saba with two divisions - 60 and 74. The Camel Brigade, with two battalions of 53 Division as to mask the defences north of the Wadi Saba. The remainder of 53 Division was to cover the northern flank of the Corps against interference from the Turkish forces in the Hareira-Sheria area. Starting from Khalassa and Asluj, the two mounted divisions of Desert Mounted Corps were to make a night march of some thirty miles and appear in the early morning to the east of Beersheba. After blocking the Hebron road they were to break into the town as rapidly as possible, seize the wells, and cut off the retreat of the enemy engaged west of the town with 20 Corps. 7th Mounted Brigade (Army troops) was to operate against the defences south of the town and form a link between 20th Corps and Desert Mounted Corps. A detachment of Hedjaz Arabs, with a stiffening of British machine-gunners and mounted on camels, was to strike the Hebron road well to the north, and harass any Turkish reinforcements moving towards Beersheba. The role of 20 Corps was not to capture Beersheba or, indeed, to send any troops into the town except engineers to operate the wells. The role of this Corps was to pin the main garrison firmly down, and thus, it was hoped, give the Desert Mounted Corps the chance to swoop into the town on its least protected side. On the night of 30/31 October some 40,000 troops of all arms moving to take up their allotted stations for the attack on Beersheba. The date had been fixed to take advantage of a full moon, but the night sultry and still and dense palls of dust enveloped the marching was columns. The assaulting infantry of 20th Corps had to be in their positions, some 2,000 to 2,500 yards from the enemy's works, by 0400 hours. They had eight miles to march over difficult ground. Through careful and meticulous staff work, and the good, solid training Chetwode had given to his Corps, every man and gun was in position well before time. Desert Mounted Corps had to march thirty miles over rough, confusing country, much of which had not been reconnoitred, using maps  compiled chiefly by guesswork. Every unit reached its allotted station by the specified time. And that was no mean feat, even for experienced troops. The front of attack of 20 Corps was a little over 5,000 yards, equally divided between 60 and 74 Divisions. Opposite 60 Division lay a strong outwork on a commanding knoll known as Hill 1070. Besides directly barring 60 Division's approach to the enemy's main line, it also prevented the batteries of 74 Division from getting within wire cutting range. The capture of this hill, therefore, constituted the first phase of the attack. At 0555 hours a heavy bombardment was opened on the hill. But the air was so still that the hill was soon enveloped in dense clouds of dust, and it became impossible for the gunners to observe the effects of their fire. The bombardment had to be suspended for three-quarters of an hour. It was then resumed, and at 0830 hours the infantry went in and carried their objective. During this phase the battalions on other parts of the front had been working forward. As soon as Hill 1070 was taken batteries moved up, under heavy artillery fire, to wire culling range. From 1030 hours to 1200 hours the guns battered the Turkish defences while the infantry edged steadily forward to assaulting distance. At 1215 hours the infantry of both divisions went in with the bayonet. Few of the enemy, however, stood to meet the steel, and by 1330 hours the whole position between the Khalassa road and the Wadi Saba had been captured and an outpost line was being established about 2,000 yards further east. The task of clearing the works north of the Saba was impeded by heavy dust, but they were finally carried by 74 Division by 1000 hours. 20 Corps had thus fulfilled its role in the attack on Beersheba. While 20 Corps was attacking Hill 1070 Anzac Mounted Division had reached the line Bir Hamam-Sir Salim, at about 0800 hours. Australian Mounted Division was in Corps reserve just south-east of Khasim Zanna. 7th Mounted Brigade was in dismounted action against Ras Ghannam, south of Beersheba. At 0800 hours Anzac Mounted Division advanced to carry out the first phase of Desert Mounted Corps' programme - the reduction of the enemy's defences east and north-east of Beersheba. These defences were anchored on strong redoubts on Tel el Sakaty and Tel el Saba. The former objective was allotted to 2nd ALH Brigade, the latter to the New Zealand Brigade, with 1 ALH Brigade in reserve. Starting from Bir Hamam, 2 ALH Brigade rode hard towards Tel el Sakaty and the Hebron road. Their pace saved them from heavy casualtles, but they were forced to dismount just short of the road. Thereafter progress was slow and it was nearly 1300 hours before the Brigade had made good Tel el Sakaty, the wells near by, and the line the road. There it remained for the rest of the day, protecting the right flank of the Corps. Tel el Saba was a more formidable obstacle. The mound lies on the northern bank of the Wadi Saba, about three miles east of the town. It is 400 yards by 200 yards in extent, with a flat, rocky top. On the wadi side its face is a cliff; on the other sides its face is steep but not sheer. It had been trenched for infantry and machine guns, and in places had two tiers of fire which swept the wadi bed and the bare plain. Shortly after 0900 hours the New Zealand Brigade advanced with the object of assaulting the mound from the north and east. Progress was slow in the face of heavy and accurate machine gun and rifle fire, the 13-pounder shells of the divisional artillery making little impression on the Turkish defences. At 1100 hours the divisional commander put in two regiments from his reserve brigade Both regiments galloped across the bare plain to within 1,500 yards of their objective before dismounting. They then advanced on foot against the south face of the mound. The Somerset and Inverness batteries, handled with great skill and dash, came into action at a range of only 1,500 yards in an effort to master the Turkish machine gunners. In a intense fire fight the two brigades gradually closed on the mound, which was finally carried at 1500 hours. 3 ALH Brigade of Australian Mounted Division, in Corps Reserve, was now directed on objectives north of Beersheba in order to isolate the town. Meanwhile it had become clear to General Chauvel that if he was to carry out his orders to seize Beersheba before nightfall, orders which had been emphatically repeated by Allenby a little earlier, methodical progress must be abandoned in favour of action designed to produce quicker results. He still had two brigades of Australian Mounted Division in reserve. One of these - 4 ALH - he now ordered to make a mounted attack direct on the town. In consequence of air attacks 4 ALH Brigade had been somewhat dispersed, and one regiment was on outpost duty. It was 1630 hours before it was concentrated and ready. Between Khasim Zanna and the Turkish trenches on the east of the town lay four miles of bare, open ground, good galloping country. The brigade deployed with two regiments forward - 4 ALH on the right, 12 ALH on the left - and 11 ALH in reserve. The leading regiments rode in three successive lines each of a squadron extended at four or five paces interval between riders. The men had no swords so carried drawn bayonets in their hands trenches machine gun squadron moved out to the left to engage on that flank. As soon as the leading squadrons appeared on the plain the Turkish guns opened on them, but the pace and open formation of the horsemen saved them from heavy casualties. Presently they came under heavy machine gun fire from the left flank, but the supporting artillery - "A" Battery, Honourable Artillery Company and the Notts Battery - picked up the flashes in the failing light and quickly found  Then the squadrons encountered rapid and sustained musketry fire from the entrenched infantry in front of them. The men rode on at full gallop, and the fire soon became erratic. The leading horsemen galloped over two lines of trenches straight on into Beersheba, overrunning buns, transport, and infantry. Succeeding waves dismounted and cleared the trenches with the bayonet. The defence fell apart in wild disorder. Night came down with Beersheba firmly in British hands. The highlight of the capture of Beersheba was the dramatic charge of 4 ALH Brigade. The charge succeeded because from first to last it was pushed home with terrific elan; because it came as a complete and shattering surprise, and because the pace at which it moved defeated the efforts of the Turkish Gunners to correct their ranges. Rifles examined after the action showed that even the infantry had failed to lower their sights below 800 yards. Consequently most of the fire at the shorter and more dangerous ranges passed overhead. The brigade had only 64 casualties, and most of these were sustained in the hand-to-hand fighting in the trenches. The charge had a notable effect besides the capture of Beersheba. It gave 4 ALH Brigade immense pride in its achievement and confidence n its prowess, and it created in very other brigade in the Corps a spirit of emulation which had important results in subsequent engagements.